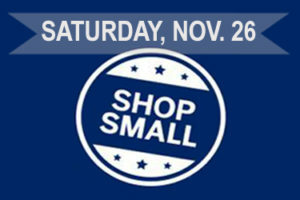 Small Business Saturday (Nov. 26) encourages shoppers to support their local economy and small business owners. With Thanksgiving upon us, it’s nearly impossible to not daydream about the delightful aromas of roasted turkey, stuffing, mashed potatoes and pumpkin pie. Although this holiday originated from humble beginnings dating back to the early 1600s, it’s clearly about food, family and football…and the official start of the holiday shopping season. Most everyone has heard of Black Friday, the day after Thanksgiving when shoppers converge upon big-box retailers, and Cyber Monday, the day when online shoppers scour e-commerce sites, to take advantage of the best deals of the season. While the excitement of scoring hot deals on Black Friday and Cyber Monday can be an adrenaline rush, many Americans have a love-hate relationship with the madness of the annual sales frenzy. By contrast, Small Business Saturday—the Saturday immediately following Thanksgiving—encourages holiday shoppers to patronize small, local brick-and-mortar businesses. Now in its seventh year, Small Business Saturday (Nov. 26) encourages shoppers to support their local economy and the small business owners who provide the majority of our economic growth. According to the U.S. Small Business Administration, small businesses represent 99.7 percent of all employer firms. Small businesses are vitally important to Arizona’s success. They contribute to our local economy by driving job growth, revenue and innovation in the Valley’s communities. In addition, small businesses also tend to attract talent who invent new products or implement new solutions for existing ideas. Arizona’s small businesses employ over 950,000 of the state’s private workforce, so it’s clear to see the tremendous impact and employment opportunities that small businesses provide and just how much they stimulate economic growth. When you patronize a small, independent business in your community, much more of your money spent STAYS local. For every $100 spent at a locally owned business, $73 stay in the local economy. In contrast, only $43 of every $100 spent at a non-locally owned business remains in Arizona. According to economic analysis firm Civic Economics, a 10 percent shift to local spending creates a massive economic impact. In a population of about 770,000, a 10 percent shift in spending creates $137 million in new economic activity, over 1,600 new jobs and over $50 million in new wages. On Saturday, Nov. 26, let’s honor and celebrate the hardworking men and women who are creating jobs and fueling the U.S. economy. Small, independent businesses add so much to the vibrancy, fabric and flavor of our distinctive communities. Now it’s our turn to show our commitment and support for small, local businesses and all they do for their communities. Community members can also show their support by liking and tagging their favorite small businesses on social media. Use hashtags #SmallBusinessSaturday, #ShopLocal and #LocalFirstArizona on Facebook, Twitter or Instagram to show your support of Arizona’s small businesses. Our local businesses are the backbone of Arizona’s economy. Help the local economy this holiday season and throughout the year. Support small businesses across Arizona in a big way and shop small.